Applying paint or a protective coating to your handgun increases corrosion resistance. 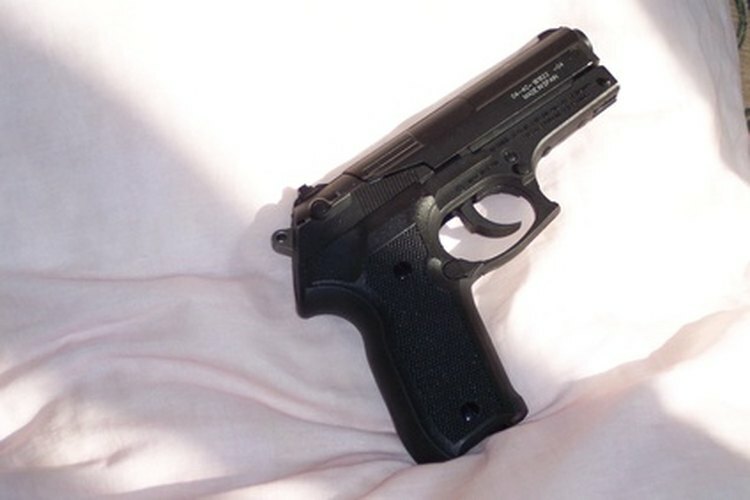 Firearms enthusiasts buy handguns based on comfort, size, caliber and reliability. They also like to customize their guns with different colors. Those with concealed-carry permits also look for good corrosion and surface wear resistance to stand up to body moisture and holster wear. A variety of colors, surface treatments and protective coatings can be applied to handguns to protect them against the elements and make them more aesthetically pleasing. Products that come in aerosol spray-can form are the easiest to apply. Drop the magazine and unload the gun. Make sure there are no live rounds in the chamber. Take down the gun and separate the components to be painted. The barrel, recoil springs, guide rod, trigger and hammer do not get painted. Clean all components to be painted with a rag soaked with brake cleaner. Remove all dirt, lint and gunpowder residue. Lay your parts on a cookie sheet and put the them in the oven set to 100 degrees. This pre-heats the parts so paint can better adhere in the next step. Remove the parts from the oven and apply the spray coating following the method outlined by the manufacturer. Set the oven to 300 degrees F and return the parts into the oven for approximately one hour. Remove the parts after one hour and allow them to cool before reassembling the gun. Ensure that there is adequate ventilation in your kitchen while the parts are baking. Do not use the cookie sheet for food preparation after it has been used for this project. Check the fit of all parts once you reassemble your gun. Paints and coatings add surface thickness each time they are applied. Check the function of the firearm before returning it to duty.